Tai Chi is well-known as a health system. However, it is also an effective martial art and was once taught to the Manchurian military which occupied China at the time of Tai Chi’s explosion into prominence. Traditionally, martial artists in China tested their skills against other styles at “lei tai” events, where fighters would compete on a raised platform – similar to modern combat sports such as Mixed Martial Arts (MMA) contests. Originally these contests would have been no-holds-barred, however nowadays rulesets have been introduced to ensure the safety of competitors while still maintaining a realistic level of contact. Modern “san shou” / “kuo shu” competition rulesets can be broadly compared to kickboxing mixed with stand-up wrestling. Groundwork, although popular in modern MMA tournaments, was not in favour in traditional Chinese society, likely as a combination of traditional values (seeing it as “ungentlemanly”) and practical concerns (seeing it as inadvisable to be on the ground in situations with multiple attackers, weapons, etc). The lineage of Oxford Wudang has preserved the Tai Chi fighting heritage, and our club has had many members who have competed in full-contact competitions, including national champions. 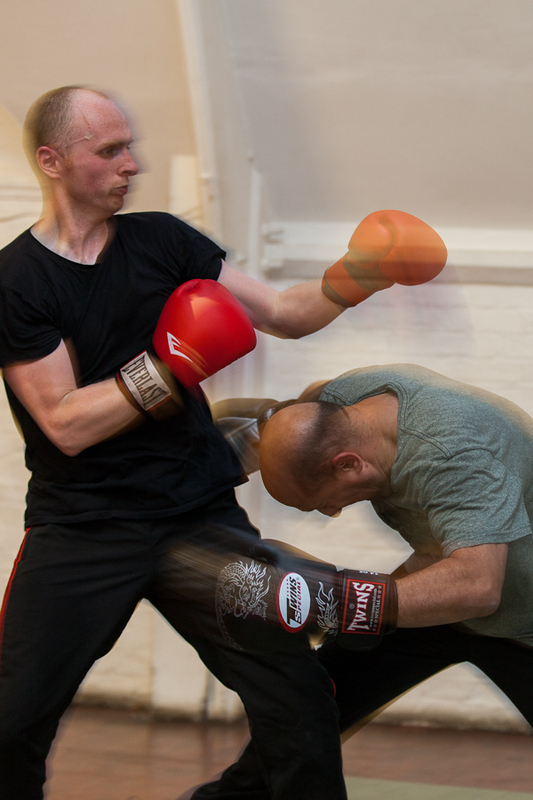 This level of training is not for everyone; those who are willing to put in the effort and commitment can participate in sparring sessions during our martial classes, beginning with light contact and moving up to full-contact training as skill and conditioning progresses. 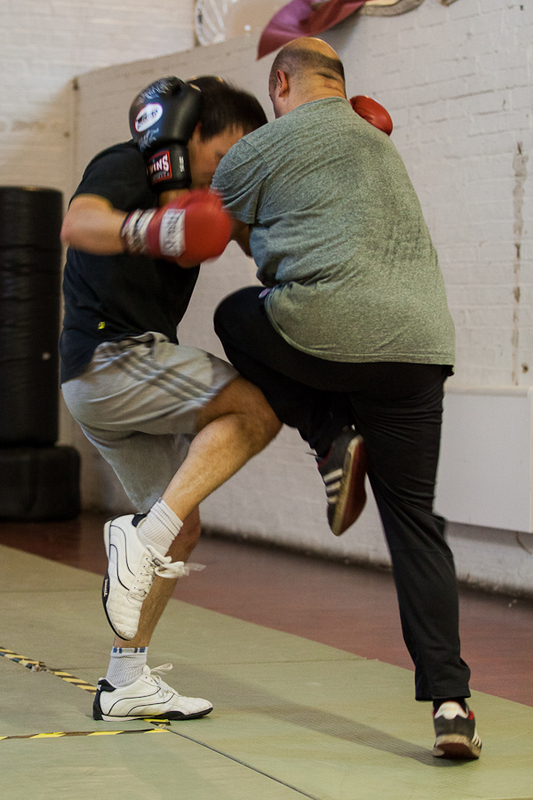 All other aspects of the training – forms, pushing hands (grappling) training, practical applications drills, padwork & conditioning training – feed into and inform this live training practice. 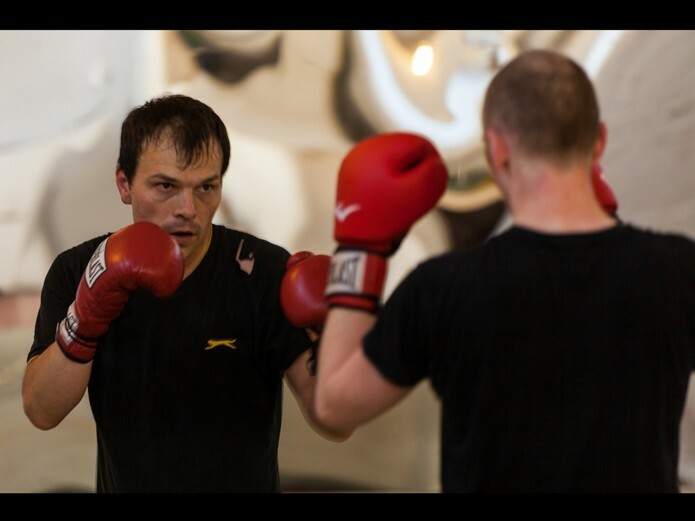 Below is a slideshow album of photographs taken during a recent sparring session (Photography by Steve Musselwhite). Due to the fast-paced nature of bouts it’s very difficult to capture moments perfectly on film, so we’re grateful that Steve has managed to take some very good photos here…! Video of fixed step pushing hands training with class members Debbie and James – and clips of application of these grappling skills to set up striking and throwing in sanshou competition by Chris and Vince. Dave and Vince demonstrating the form and application for the move Sweep Lotus Leg, including some footage of this technique being applied in Sanshou competition by Vince. Dave and Vince demonstrating the form and application for the move Brush Knee Twist Step, including some footage of this technique being applied in sanshou competition by Vince and Chris. While much is made of using Yin (softness) to overcome Yang (hardness) in Tai Chi literature, the converse is also true. When the opponent’s defence is weakened, the Tai Chi practitioner can take the initiative to attack strongly (Yang) to overcome the opponent’s weakness (Yin).